Nikon has updated the Capture NX tutorials on their Digital Knowledgebase to include additional content on printing and color profile management. The tutorials can be downloaded as Adobe Acrobat files. The new content includes how to make contact sheets, soft proofs, borderless prints, auto levels contrast, and color profile batch conversion. The Nikonians Academy staff is providing Nikonians across the U.S. with the chance to learn digital printing from one of the masters. Darryll Schiff will lead the one-day digital printing workshops in the Chicago area on June 22, New York area on July 27, San Francisco area on September 7, Los Angeles area on September 28, and in the Atlanta area on November 4. Darryll is a fine art photographer with work appearing in collections of MOMA New York, the Art Institute of Chicago, George Eastman House, Norton Simon Museum and Museum of Contemporary Art, Chicago. Check our Nikonians Academy North America Workshops 2007 schedule for dates, locations and registration information. Nikon has struck another marketing winner, this time with their Picturetown campaign. Two hundred D40 cameras were handed out to residents of all backgrounds in picturesque Georgetown, South Carolina. The campaign showed how easy it was to take quality photos just by having the right camera in hand. Epson America printed all of the photos for posting on the town bulletin board as well as enlargements for personal enjoyment. The Picturetown website also documents behind-the-scene stories, individual commentaries on each of the photos and a full gallery of the residents' work. For our members using SilverFast scanning software, version 6.5.0r6 now features Auto IT8 calibration without having to prescan or even accurately align the paper target. LetsGoDigital.org has published their much anticipated Fujifilm S5 Pro review. The Fujifilm FinePix S5 Pro is not a product for the masses, but will undoubtedly be loved by photographers that want to get the most out of their daily digital workplace. Adobe has delayed releasing Camera RAW 4.1 until Friday 01-June-2007. The update will feature additional support for newer DSLRs such as the Fujifilm S5 Pro, the Nikon D40X as well as improvements to sharpening and noise reduction tools. An entry in the Photography Press site shows off a very neat Coolpix conceptual camera that allows you to rotate the body to take full 360-degree photographs rather than rotating the camera on a specialized tripod head. Les Rencontres d'Arles, the combination photo festival and exhibition that has been described as the largest and most important photo festival in the Europe, Middle East and Africa (EMEA) region, begins in the first week of July. Please make sure that in the message you provide your username, full name, full mailing address and phone number and your dates of attendance. Nikonians are also invited to bring high resolution images that will be printed professionally by our friends at HP. This year's festival packs a full schedule of events, beginning with a full week dedicated to professional photographers, continuing with July workshops from the professionals, and a summer-long exhibition (concluding Sept. 16, 2007) open to general public. HP will be on hand at the Hotel dÃ¢â‚¬â„¢Arlatan, hosting special events, a street photography exhibition and seminars from professionals and advanced amateurs. In addition, their HP Print Center will be available featuring live demonstrations of HP printers and media, HP Indigo Press, the DJ Z-Series Printer and the Photosmart Pro B9180 Printer. HP is also offering a portfolio review. Participants show their work to experts and get feedback for further creative and technical improvement. The best portfolio will win a new Photosmart Pro B9180 printer and selection of HP papers. The HP Photosmart Pro B9180 was the subject of a review by Rick Walker and Jason Odell in recent broadcasts of their Nikonians Image Doctors podcast. Their hands-on HP B9180 review for Nikonians came in two parts, broadcast on March 29 and April 12, 2007. If you were entertaining the idea of a summer trip to Southern France, armed with your Nikon gear and a passion for photography don't forget Arles. For an interesting article on the event, check the preview article written by American Photo's Miki Johnson, and posted by PopPhoto.com - the online home of Popular Photography & Imaging and American Photo. Arles tourism information is available in French, English, German, Italian, Spanish, Japanese and Chinese. Back from Texas, the Image Doctors share some of their shooting experiences from their wildlife photo workshop. Afterwards, take another trip down memory lane as Jason and Rick examine the Nikon F4. Nikonians interested in the NikonD40X can now read the latest review by our friends at LetsGoDigital. The comprehensive review is available in English, German, French, Spanish, Turkish and Nederland versions, and includes a large selection of downloadable samples. The D40X is also a hot topic in our Nikonians D40/D50 Users Group Forum. Our members in the UK will be pleased to hear that Nikon is offering full versions of Capture NX free with every D200 purchased between 18-May and 13-July of 2007. Ilford's Director of Marketing, Howard Hopwood, is bullish on the future of emulsions in photography. Good news for photographers who want to "geotag" their photos - the di-GPS add-on product allows easy recording of physical location and time/date of each frame. The latitude, longitude, elevation and UTM is embedded directly into the metadata of each photo at capture time, so there's no need to manage the information separately. The manufacturer currently supports Nikon new generation bodies such as the D200, the D2 series and the Fujifilm S5 Pro only, so Nikonians can boast (for now) having this capability exclusively. Phase One has joined forces with Microsoft, offering Capture One PRO and iView MediaPro 3 together for only $499 (US), as a powerful digital image capture and workflow combination. If you haven't heard the news yet, Microsoft acquired iView Multimedia in June 2006 and is developing the cross-platform cataloging tool into a next-generation product named Microsoft Expression Media. Digital imaging workflow techniques have always been a matter of personal preference mixed with each individual photographer's needs and budget. Software experts in the field recognize the obvious: "You can't please everybody all the time, but you can sure try." This move by Phase One and Microsoft reflects an understanding of the personal preference factor. Rather than boast that each, individually, is the "one-package" that fits all needs, the two have combined forces to provide an attractive package worthy of serious consideration. Our friends at Phase One have provided an informative podcast explaining the workflow solution. They also provide valuable additional information, including the insights of British fashion photographer Drew Gardner, who has experience with this combination. Hoya has decided to continue talks with Pentax through the end of May in an attempt to salvage the earlier merger offer announced in 1Q07. Should the talks fall through once more, Hoya is preparing to carry out a takeover bid in June. Through a clause negotiated previously, Pentax is also beholdened to honor a three month "healing period" through 31-August and must reject any competing bids offered by other companies during that time. Hoya will receive a USD25MM penalty fee for any violation of the agreement. The negotiations have been complicated by the proposal of the majority shareholder in Pentax, HSBC Sparx, to restore two former company officers who were ousted after the inital merger talks with Hoya fell through. Pentax indicated the inital Hoya talks were conducted arbitrarily without board approval and re-appointment of the officers would add to further confusion as attempts to keep the merger on the table continued. Amazon has acquired Digital Photography Review (DPReview.com), the well-known review and forum site run by Phil Askey since 1998. The site will "continue to function as a stand-alone operation based in London." The move marks a continuing trend in content consolidation as Amazon seeks to build or acquire sites that complement it's sales channels, especially in consumer electronics. Japan's Olympus Imaging Company has opened it's first official retail store in New Delhi today, marking a departure from the use of reseller channels. India has long been seen as a potentially lucrative market for digital camera sales; nearly 700,000 cameras were sold to date in the nation last year and with a booming economy, the growth potential is enormous. Photo District News Online has a summary page with the deadline dates for many major photography contests and events, such as the Eddie Adams Workshop, The Eugene Smith Foundation Grant, PDN/Nikon Self-Promotion and more. Nikon announced last week that it had nearly doubled their profits at the end of this year's quarter and well ahead of projected earnings, thanks to robust sales in digital SLRs and lenses. Sigma Photo of America announces the launch of the 2nd Annual Photo Contest. This year's theme is called "Perfect World." Entries must be submitted by 30-June-2007 and must be taken by a film or digital camera using a Sigma lens. Prizes include a variety of Sigma hardware. 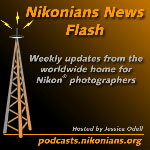 Tune in to find out about Adobe CS3 conferences, new Fantasea housings, and the latest from the Nikonians Forums. The latest edition of The Nikonian is available for download. Fantasea has introduced a housing for Nikon's D40 and D40x DSLRs. Find out more in our news blog! CS3 one-day conferences from Adobe! Coming soon to a town near you! Help out with a CD cover photograph. Kudos to Andy Bredemeier for winning the "best submission" award in last month's online photo assignment. 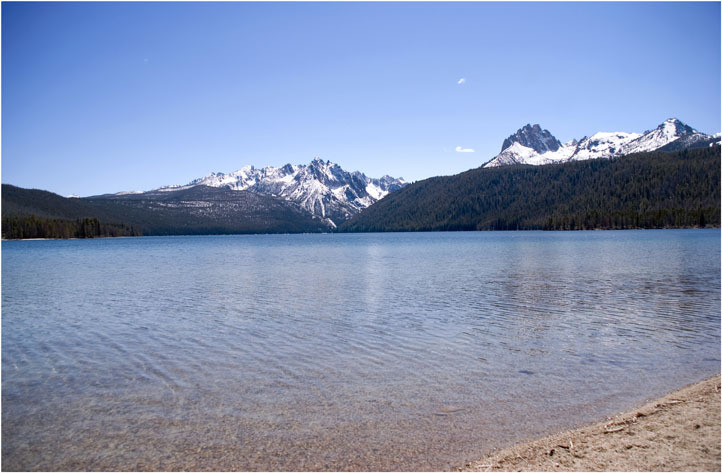 Forum Of The Week: Travel Photography. Contest Winner. Listen in to find out! NewsFlash will be back in June! Thanks for listening in, and Jessica will be back soon! The latest edition of THE NIKONIAN is now available. This is the official quarterly publication of Nikonians, the Nikonians electronic magazine (eZine) for Nikon photographers. Highlights in this latest edition of THE NIKONIAN include our Nikonians Photographer of the Year 2006 Contest Results (with links to the finalists gallery); a PMA'07 Report featuring Hewlett-Packard & Nikonians partnership; in-depth articles on custom menus in the field; and a valuable guide to help you understand photo filters. It also includes our team profile on Lela Bouse-McCracken (owl) , and a "New from Nikon" focus on the D40X (with quick comparisons to the sister model D40 specifications and our Nikonians perspective) and the new 55-200MM Vibration Reduction Zoom-Nikkor Lens (with a special link for our COOLPIX members). This issue also features a Markins ball heads review and a Think Tank Rotation360º backpack-beltpack review. It also adds late-breaking news of the Nikonians Academy Workshops expanding to 23 cities. For a look at previous editions don't forget they are available here. Newsline International reports that two of Japan's popular photographic retailers are opening competing one-hour repair services of digital cameras. BIC Camera is offering repairs in 60 minutes at one of their central Tokyo locations on any in-store designated brands, namely Nikon, Canon and Olympus. Free troubleshooting is also provided. Competing chain Yodobashi is also offering the service covering the same brands. Certain Fujifilm and Casio brand cameras may also be repaired, but at a four-day minimum. Fantasea has announced their latest DSLR housing, this time for the D40/D40X - rated to 200 feet (60 meters) and is customized to fit the camera with the Nikkor 18-55 DX. Also new to their line-up are cases for the Coolpix L10 and L11, with complete access to all controls. Adobe is offering One Day conferences on the new Creative Suite 3 in a variety of U.S. cities, starting 16-May-2007. For USD79, participants will learn about the newest image editing during the morning, get an opportunity to speak to Adobe experts about specific needs in the afternoon, and browse the Solutions Showcase for a wide variety of Adobe partners and their offerings. Registered attendees also receive a Lynda.com training package and plug-ins from onOne software at no extra charge. News from Sigma, FujiFilm, and Nikon in the UK! Find out about bokeh, and how to get a free Nikonians t-shirt that will make all your friends jealous! Sigma's compatibility list for the Nikon D40 DSLR. S5 Pro owners can update their firmware here. UK wildlife photographers interested in the Nikon talks/demos at London's Wetland Centre can find more information here. Call 020 8409 4400 to book your place! Segment II of the Photographer of the Year 2007 contest is now open! Categories are Nature, Still Life, and Portrait and the contest is open through June 30. This month's Online Photo Assignment is "bokeh". Golf Tournament photographers can give Cam some advice! Lexar has rolled out a new expansion card based on the recently-announced Solid State Drive (SSD) memory technology. The Expresscard SSD will be a boon to mobile electronics users; it can be used as both a large scale memory cache and a portable storage device. The ExpressCard's SSD-based "drive" is faster than most commercial storage devices to date, allowing read and write operations (like large photos) to be quickly retrieved, edited or saved at a much faster pace than using a traditional platter hard drive. An automatic backup program is included, to simplify using the product as a redundant storage unit. In addition, personal computers running Windows Vista can use the ExpressCard as additional RAM memory with the operating system's ReadyBoost feature. The card will be available in 4GB, 8GB and 16GB sizes. Hewlett-Packard Corporation has filed a lawsuit against Swiss-based Pelikan Hardcopy, claiming patent infringement on print cartridge and ink formulation. The legal action centers around Pelikan's creation and distribution of new print cartridges called H06 and H08. Details of the infringement lawsuit were filed in a court in Dusseldorf, Germany. HP has requested, among other things, a cease-and-desist order be placed against Pelikan. The capacity and performance bars were raised once more today by Samsung; with their announcement of mass-producing a sixteen (16) Gigabyte NAND flash chip. The icing on the cake? The chip's MLC (multi-level cell) design has doubled the read and write speeds over current technology. Expect to see this in the form of camera media cards soon. Fujifilm has posted another firmware revision for the S5 Pro Digital SLR. 2. Better white balance when setting AUTO-mode for the WHITE BLANCE and using Nikon non-CPU lenses. *It requires to set the maximum aperture according to the FinePix S5 Pro Owener's Manual(p.121- p.124). Sigma has released a compatibility list of lenses that will autofocus with the Nikon D40. The list should apply as well to the D40X since everything but the CCD sensor is identical between the models. Curiously enough, the Sigma 80-400mm f4.5-5.6 OS is also listed, yet this lens lacks the HyperSonic Motor (HSM), equivalent to Nikon's Silent Wave coreless drive. A hint that a much desired HSM version is on it's way or a typo? Update 1: Sigma USA has indicated that this is not a typo. In addition, one of our members has confirmed that there is no shaft drive connection on the 80-400 OS, leading us to speculate that the AF motor on the lens is likely a pencil or micro-drive version of HSM, similar to the downgraded Silent Wave motors in the Nikkor 18-55 DX and 55-200 DX.